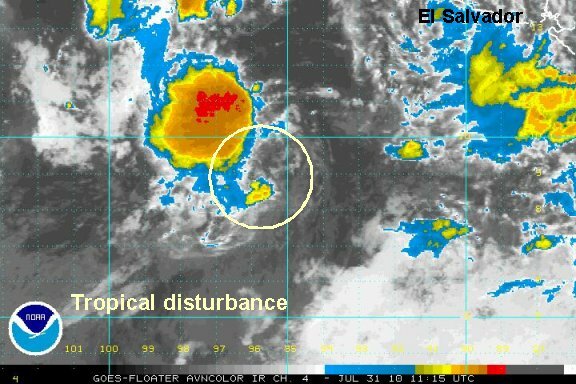 A tropical disturbance is south of the coast of Mexico and is moving away from the mainland. Yesterday visible satellite imagey showed a clear low level circulation with some convection. It looked as though the upper air winds would destroy the convection with this low. This morning the low is still apparent with deep convection removed from the center of circulation. NHC only gives is a 10% chance of becoming a tropical cyclone. This is baffling since it appears to be a depression at this time. It will not affect Mexico and move out to sea.... this may be the reason of leaving it alone. As of 8:00 am edt / 5:00 am pdt the tropical disturbance was centered near 9°N / 96°W or about 450 miles south southwest of the Gulf of Tehuantepec, Mexico. Movement is to the west northwest at about 10 mph. Top sustatined winds are estimated at 25 mph. Visible satellite image shows that the low has weakened. The low was well defined yesterday. This will be the last update.